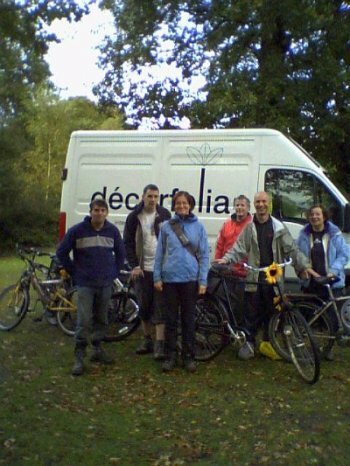 During the Autumn of 2008 Pat saw some posters advertising a sponsored bike ride through our wonderful New Forest raising funds for Oakhaven Hospice. This is a local charity based in Lymington and most of us here at Decorfolia have known friends and family helped by this wonderful local Hospice. I put it to everyone and we were agreed, let's ride and raise money in the process. That Sunday saw one of the most windy, wet mornings of the year - tree bits falling down and flooding over much of the Forest. We had arranged to meet at our office, what a superb bunch Decorfolia (and partners) are! there we were dressed for the occasion - Mark Fryer (Mark one) arrived on his sit-up-and-beg bike, complete with supermarket bags to protect his feet, at the other end of the scale was Geoff, Kate's other half, with a super-dooper mountain bike complete with suspension and disk brakes. We went to the starting point, expecting the event to have been cancelled, but there they were, the local Rotary Club handing out forms, collecting money and looking very damp! The route was well marked through the traffic free gravel roads in the Forest, however, the heavy rain had transformed the hard packed gravel paths into muddy rutted rivers - have you ever tried to ride a bike through porridge? It was such hard work, however half way round the wind and rain eased off and our muddy faces started to smile. We all completed the 15 miles - a long way off road - and we raised a good sum for Oakhaven Hospice, next year we might even ask some of you if you would like to make a small contribution.